Skyraider. SPAD. Sandy. AD. A-1. Whatever you call it, it's legendary. Now it gets the full, gold-plated "Ginter" treatment in Douglas AD/A-1 Skyraider – no. 98 in the publisher's acclaimed "Naval Fighters" series, and first volume of a multi-part study of this classic combatant. 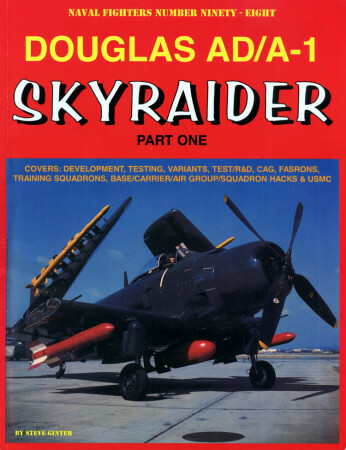 The subtitle superbly summarizes contents: "Development, Testing, Variants, Test/R&D, CAG, FASRONs, Training Squadrons, Base/Carrier/Air Group/Squadron Hacks and Marine Skyraiders." And it follows Ginter's proven prescription. That means hundreds of photos, dozens of illustrations, scores of tech-manual excerpts, and pages and pages of production permutations. After illuminating background notes on Skyraider derivation, design and development, contents course through all AD-1 through AD-5 versions – including the turboprop-powered XA2D-1 Skyshark, subject of Ginter's "Naval Fighters" 43 by Gerry Markgraf. The author offers simply mind-numbing levels of textual and graphical detail. Variant coverage includes dimensions, specifications, performance, production totals and BuNos. Deployment comes next. That's where you'll find at least 50 separate sections on US Navy and Marine Corps Skyraider units and use – complete with unit heraldry. Hobbyist? Don't expect Ginter's usual modellers' section. Guess we'll have to wait for subsequent segments. Then we'll also see how he handles USAF and international Skyraider service. Wow. Wow. And double "Wow". Get Steve Gitner's excellent effort. Then line-up behind me for future volumes!